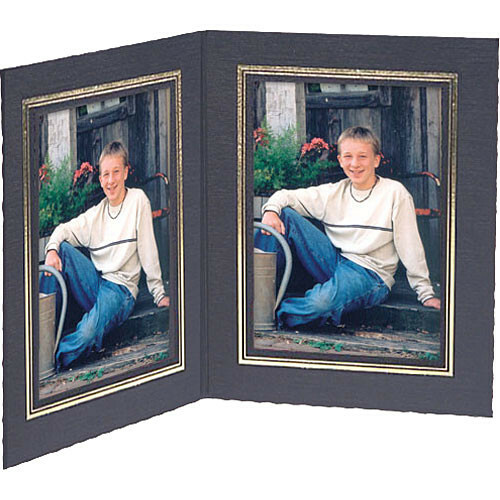 The Collector's Gallery Double View Portrait Folder Classic Style with Gold Foil Window Border , Model PF5502-46 - for 4 x 6" Prints (Portrait Format) is a great way to display those treasured memories and moments. These designer frames provide a wonderful medium in which to show off either that great event or a loved one. The double-fold design provides sturdy support, whether in portrait or landscape format. This frame spreads apart and rests comfortably on desks, tables or shelves. This frame is available in three styles: Contemporary (without foil border), Classic (with gold foil border) or Conventional (with black foil border). Box Dimensions (LxWxH) 8.125 x 6.063 x 1.75"